To assess the safety and efficacy of microwave ablation (MWA) for primary papillary thyroid microcarcinoma (PTMC) with a large sample of 185 patients. A total of 185 patients underwent MWA for 206 primary PTMC nodules. They received ultrasound follow-up at 1, 3, 6, and 12 months after MWA and every 6 months thereafter. Nodule volumes were calculated at each follow-up and compared with those before MWA. Additionally, the volume reduction rate (VRR) of the nodules was calculated. 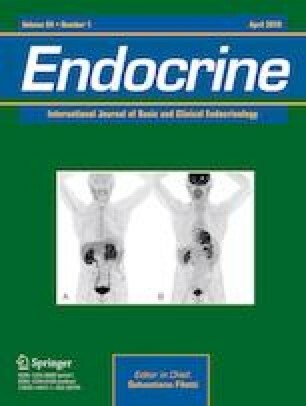 Patients’ thyroid functions were tested before and 1 month after MWA. The mean follow-up time of the 185 patients was 20.7 ± 8.8 months (range 12–36 months). During the follow-up period, the mean volume of the 206 nodules was 100.1 ± 92.9 mm3 (range 3.6–423.9) before MWA, which decreased to 2.2 ± 5.6 mm3 (range 0–20.3 mm3) after MWA (P = 0.000). The mean VRR of the nodules was 98.65 ± 3.60% after MWA (range 83.85–100%). One hundred and seventy four of 206 nodules (84.5%) were fully absorbed. Compared with the preoperative results, no significant variation in thyroid function was observed 1 month after MWA. Thirty-eight patients (20.5%) had different types of complications, ranging from minor to major. Five patients (2.7%) had hoarseness, 11 patients (5.9%) had bleeding, 21 patients (11.4%) had earache or toothache, and one patient had another lesion 1 month after MWA. This preliminary study suggests that MWA is safe and effective in the treatment of primary PTMC and offers a new alternative for clinical treatment. This study was funded by the Finance Department of Jilin Province (No. SCZSY201701), the Jilin Provincial Health and Family Planning Commission (NO. 2016ZC032) and Jilin Province Science and Technology Department (NO. 20170414042GH). The studies have been approved by the appropriate institutional research ethics committee and have been performed in accordance with the ethical standards as laid down in the 1964 Declaration of Helsinki and its later amendments or comparable ethical standards. This manuscript does not contain any studies with animals by any of the authors.